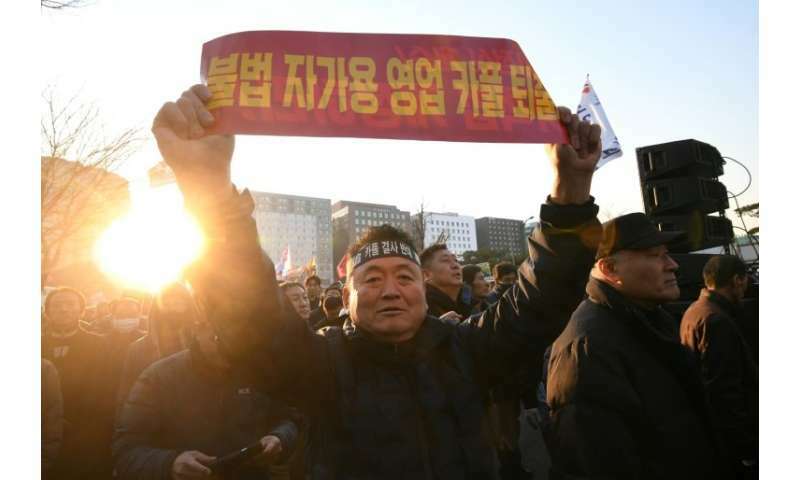 An estimated 50,000 taxi drivers, wearing headbands, chanting slogans and waving banners, rallied outside the parliament, calling for the car-pooling app to be banned, AFP photographers at the scene said. Drivers say the service being introduced by KakaoTalk—the country's largest mobile chat app—will threaten their livelihoods. A 57-year-old taxi driver committed suicide by setting himself on fire in a solo protest outside parliament in Seoul last week, forcing KakaoTalk to delay their launch of the service, initially set for this week. 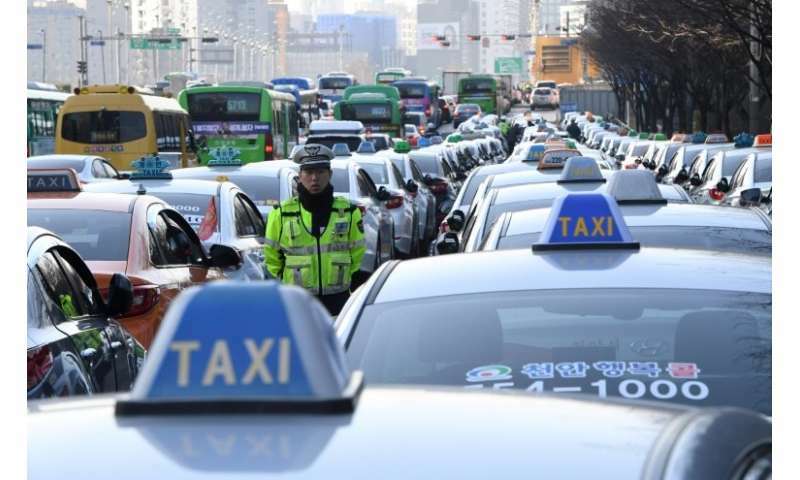 Only a limited number of the country's 252,000 taxis were taking passengers on Thursday, Yonhap news agency said. Traffic jams were reported on some highways leading to the capital as taxi drivers drove their vehicles at a snail's pace across the river Han, raising concerns of evening traffic chaos on the giant Mapo Bridge. 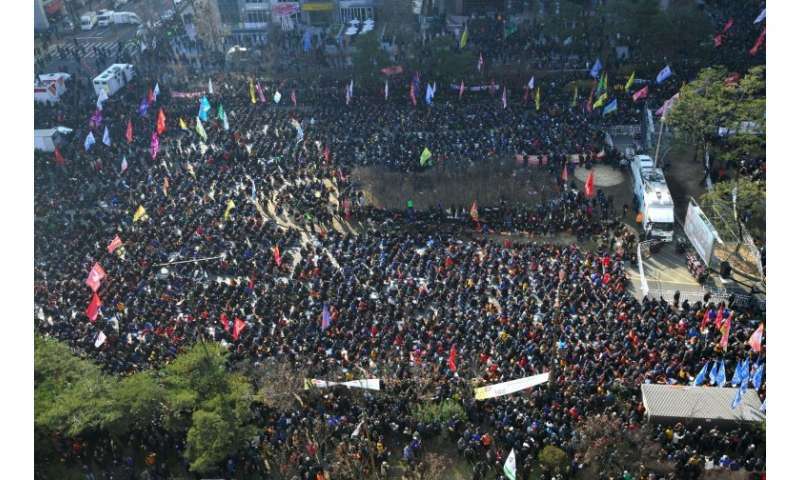 Police have mobilised 9,000 riot police to maintain order, Yonhap said. A backlash from taxi drivers in South Korea forced US giant Uber to close its main ride-sharing service in 2015. The company now has only a minimal presence in the country, offering only taxi- and licensed-hire vehicle services. KakaoTalk is used by more than 80 percent of South Koreans, and in recent months tens of thousands of taxi drivers have held mass rallies in Seoul to condemn its upcoming car-pooling service.